Category Archives: Gambit Publications Ltd. 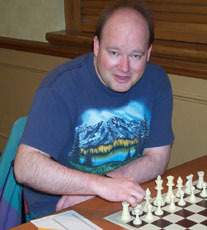 FIDE Master Graham Burgess needs no introduction to readers of English language chess books ! Minnesota, USA based, Graham has authored more than twenty five books and edited at least 250 and is editorial director of Gambit Publications Ltd. In 1994 Graham set a world record for marathon blitz playing and has been champion of the Danish region of Funen ! Readers may remember “101 Chess Opening Surprises” published in 1998, also by Gambit Publications, was well received and added to GKBs reputation for originality, accuracy and encyclopedic knowledge of openings. 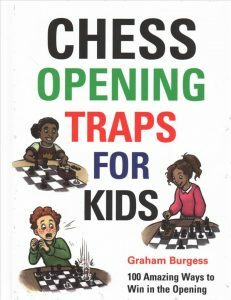 Chess Opening Traps for Kids is the fifth in a series of “for Kids” books and is robustly (!) hardbound in a convenient size such that weights are not need to keep it propped open (unlike some A5 paperbacks) meaning studying with this book is more convenient than with many books. The layout and printing is clear (as you would expect with Gambit) with numerous diagrams at key moments in each, relatively short, game. In essence, players under 18 (for whom this book is intended) will find it easy to dip in out of and it can be used without a board (although BCN would always recommend following each game on a “proper” board). As you would expect with Gambit, the notation is English short form algebraic using figurines for pieces. One slight criticism is that the diagrams do not have “whose move it is” indicator. We know that many readers like to see this on all diagrams. However, each diagram does have coordinates; welcome for the junior readership. 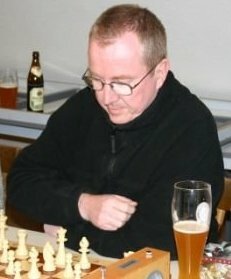 Graham has identified and described 100 unique themes (usually tactical) that lead to relatively short wins out of the opening, many of which could be termed “miniatures”. An example theme is “Drag the King Out with Nxf7” : “Sometimes players leave f7 so weak that a knight sacrifice on that square wins by force. The signs to look out for are a queen that can invade on e6 and other pieces ready to support the raid.” Under this theme the author presents three examples (typical for each theme) from different openings plus supporting analysis and explanation. A range of openings are demonstrated that yield a similar trap. For example, The Siberian Trap is shown from the usual perspective of the Sicilian Defence and the Queen’s Gambit Accepted. In the main, the author does not get bogged down giving details of who were the players of the games and when and where they were played but does in a few cases where the players are especially well known. The author’s explanations and language are clear, concise and presented with a friendly and engaging style. There are numerous cross references to other themes when an idea uses a previously mentioned one. All of this contributes to the learning experience and the pattern recognition aspects of chess that are especially important for young players in their formative years. Thankfully, there is no recourse to engine evaluations and the emphasis is to use one’s personal brain engine in making an assessment. (One of our bugbears as chess teachers and coaches is juniors increasingly relying on engine assessments rather than their own brains). Having worked through the 100 themes the student is presented with 48 exercises (with solutions) that test the students understanding (not memory) of what they hopefully have learnt. Finally there are useful tips on further improvement and how to make progress. In summary, this is an excellent book with much original material presented in a clear and friendly way and therefore to be recommended. One negative comment we would make concerns the cover. “Never judge a book by its cover” we are told and you might look at this book cover and think it was suitable for say primary aged children. I would say not but I would suggest it suitable from secondary aged children. I would say strong juniors from 12 upwards would read this book and enjoy it. Apart from the “move indicator” we would like to see an index of openings from which the theme examples were obtained. The title and cover might, perhaps, put off the adult club player market. However, the content is totally suitable for adult club players upto say 180 ECF or 2000 Elo. Official web site of Gambit Publications Ltd.
Coming soon to your sixty four squares !